How Many Patents Did Edison Have? Humans are always trying to categorize, measure, and compare things. This site shows how incomprehensible the size of our universe is. I guarantee you’ll spend some time searching through this site. Nikon did an amazing job with this. A group of bioengineers and immunologists at Harvard University (didn’t see that one coming) have developed a way to get immune systems to attack tumor cells. Normally your body’s immune system won’t attack tumor cells because it’s not seen as a threat since they aren’t introduced to your body but rather “grown” there. By implanting a 8.5mm diameter polymer disk containing tumor-specific antigens under the skin of a mammal, the group from Harvard discovered that the immune system reacts by targeting the tumor cells. The disk is nearly 90% air so blood can easily travel through it in order to pick up the antigens. In non-science terms, it’s like a hitman (the blood cell) walking through a crowded area without knowing he has a target yet. Then he passes through the same coffee shop he visits everyday (the area under the skin) and someone hands him a description of a target (the tumor-specific antigen). You get the rest. Read a much more detailed article here. Just a side note; the source article kept referring to the polymer disk eliminating tumors in mammals… I’m just wondering exactly who or what the test subject was. It seems like a politically correct way of either saying “they paid some people off the street” or “they took some animals, infested them with cancer, and then shot these disks under their skin.” Either way, it would piss a lot of people off. On one hand you’d have human rights activists and on the other you’d have animal rights activists. Who’s crazier? An Italian Doctor has stumbled upon some findings that may lead to the cure of Multiple Sclerosis. Dr. Paolo Zamboni discovered a connection between the blockage of blood flow that removes iron from the brain and the debilitating effects of MS. It is known that a build up of iron can damage blood vessels, however no one thought it would have any effect on the brain. Dr. Zamboni tested his theory by taking 65 MS patients and performing an operation that allowed unrestricted blood flow out of the brain. 73% of the patients had no MS symptoms two years after the procedure. How amazing is that? Read a more detailed version of the story here. Way down South in Antarctica there are these beautiful icebergs. It’s unlike anything I have ever seen before. Photo credit goes to DailyCognition. The stripes are due to meltwater seeping into cracks in the ice and freezing as well as sea water containing algae and other organic material freezing in layers. 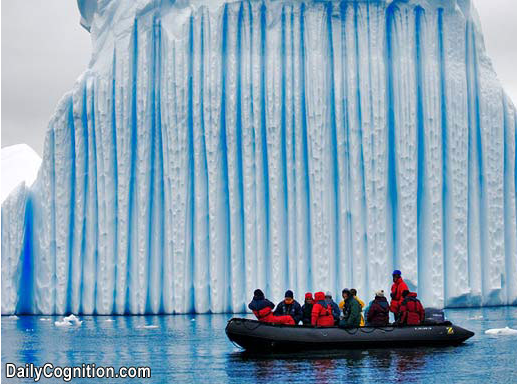 Check out this link to learn more: Striped Icebergs in Antarctica. Researchers from the University of Pennsylvania School of Medicine and the Center for Cellular and Molecular Therapeutics at The Children’s Hospital of Philadelphia have found a way to use gene therapy to allow children with congenital blindness to see again. This is what happens when you mix potassium chlorate with a red gummy bear. Pretty cool. You used to be able to buy iodine crystals… but that’s not longer the case. Unfortunately iodine crystals are used in the production of meth, and just like anything else used in the production of meth, it has become regulated. The good news is, there are ways to make iodine! Here’s one method of how to make it, and a simpler one that almost anyone can do is included at the bottom. Warning: Do not ingest this iodine. Not only would it taste horrible, and leave your mouth looking as though a dye bomb went off inside, but around 2 grams is enough to cause death. This is not the same iodine you find in vitamin supplements, this is elemental iodine! Prolonged, sometimes even brief, contact with skin can cause lesions and nasty discoloring. Wear gloves when handling iodine, and do this experiment in a well-ventilated area. Also, all the normal precautions apply- wear goggles, don’t light anything on fire that shouldn’t be on fire (i.e. everything but the lamp/burner), and never work with chemicals that you aren’t comfortable with or don’t know the dangers of. This lab procedure is meant for educational purposes only. Okay, so you’ll need to potassium permanganate, potassium iodide, sodium bisulfate, water, rubbing alcohol, two test tubes, a stopper with a hole in the top, a bent glass tube, and a flame source. Everything but the alcohol and flame can be found here. I have to admit, I went without a scale for this experiment and eyeballed about how much of each chemical to use. This is normally very bad practice and I wouldn’t recommend it. However, it works well for this experiment since the exact amount created is not of concern. The ratio of volumes of each chemical are 1 part KI to 1 part KMnO4 to 3 parts NaHSO4. I used a pinch of KI, a pinch of KMnO4 and about 3 pinches of NaHSO4. I then added about 3 drops of water to the mixture. Cool, now your mixture is all set. Cap it and place the bent glass tube in the top. Take another test tube and add about 8ml of rubbing alcohol. Iodine dissolves readily in alcohol. Get your flame ready and either a pair of test tube holders or a test tube clamp. Place the open end of the bent glass tube into the test tube with rubbing alcohol. Place the end of the glass tube just above the alcohol. Within a few seconds of heating the mixture (now turning to solution) you should see some purple gas forming. Very quickly some residue will be coming out of the glass tube. Every once in awhile dip the end of the glass tube in the alcohol to dissolve some of the residue. NOTE: The solution may start to boil rapidly. If/when this happens remove the heat source until it settles down. Pretty soon the gas will stop being produced. Unfortunately, this means the end of Iodine production . No worries though, there’s more cool stuff to come! One you have your solution, the final step is easy! Add water to your solution until you see a precipitate forming. Elemental iodine is not all that soluble in water (about 1 gram/3.45L), so it will precipitate out when water is added. Since only a little bit of iodine was created, don’t add too much water or it might almost all dissolve. NOTE: Adding some potassium iodide to the solution with the precipitate will bring the solid iodine back into solution. Finally, extract the precipitate and let it dry. So, that was the complicated (but cool) way of making iodine crystals. The other way is much easier and involves a trip to your local drug store. Pick up a bottle of iodine solution (usually labeled iodine tincture) and a bottle of hydrogen peroxide (even if you have a stuffy nose, resist the urge to buy Sudafed along with these). The highest grade of each will produce the best results. Mix the two together and let the mixture sit for awhile. Iodine will precipitate out. Yes, I know, this was is much easier and probably more environmentally friendly. However, it’s wicked fun to see iodine gas and using a flame makes everyone happy.